Hours upon hours of good times and great fishing. Why not get all of that for one of our fantastic rates? Description: Pick any day out your week at your convenience and let Captain Eddie show you the best spots to catch the best fish. Come solo or bring a partner or crew with you. All weekday trips will leave at 12:00 Noon and return at 12:00 Noon 48 hours later. What to Bring: Just bring your fishing tackle and what ever you want to eat and drink for the trip. We suggest you look at the What to Bring page for ideas. I supply the boat bait fuel and ice. A 50% deposit is due 2 weeks after you make your reservation. A reservation may be held 7 days without a deposit. After 2 weeks the dates will be open to new inquiries. A confirmation letter (contract) will be emailed to you when your deposit is received. Please include the dates of the trip in the memo blank of your deposit check along with all contact numbers, especially cell number. Space is very limited, especially weekends, so don't delay. Sometimes two parties will send checks for the same date, if this happens, the check with the earliest post mark will be accepted and the later deposit will be returned. We do not accept multiple checks, send one check only. Remember to write in your dates in the memo blank on your check in case the check gets separated from other records. Always include your phone number and any other pertinent information. No Refunds. Parties must show up at the dock the morning of departure. If our wind gauge reads over 25 mph (we do not trust the weather service, they are very unreliable), we will postpone for one day. If winds continue over 25 mph we will reschedule - however, the trip MUST BE taken before year end. 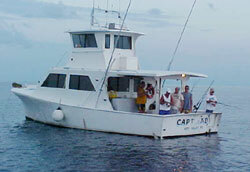 If the winds are 20 to 25 mph we will fish protected waters of the Marquesas Keys and surrounding reefs. Weather is not a concern in our area; we can always find places to fish where it is comfortable and enjoyable. We do not visit Fort Jefferson National Monument in winds higher than 15 to 20 mph. We do not postpone trips because of rain (the fish do not mind!). We have a full awning. Policy varies during the off season (we have other open dates to reschedule). We do not have this option during the season and peak season. If you wish to postpone a trip that you have already reserved, you would have to notify us AT LEAST 30 DAYS PRIOR TO DEPARTURE. In that case we will reschedule for another date before year end with the exception of peak season (April through July).